A record-setting four Fulbright finalists were selected from Goucher for the 2017-18 academic year. Litza Jimenez ’17, Sabrina Jimenez ’17, Conor Snow ’15, and Isaiah Zukowski ’17 were each chosen for the prestigious honor. This is the highest number of Goucher graduates to be selected as Fulbright finalists in a single year. The Fulbright program is the flagship international student program sponsored by the U.S. State Department. The program recognizes scholars for their academic, professional, and leadership success. 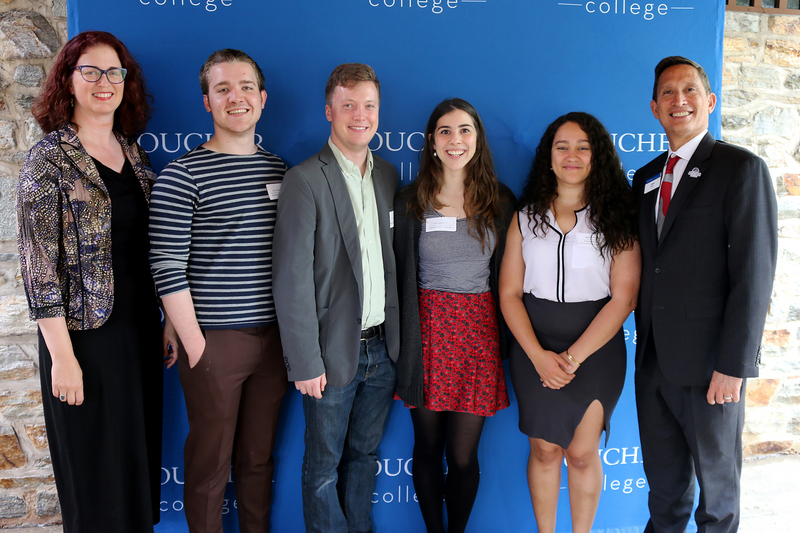 The four Goucher students are part of a group of more than 1,900 U.S. citizens who will study, conduct research, and teach abroad next year. Sabrina Jimenez will attend University of Paris Descartes, for its Clinical Psychology and Integrative Psychopathology Masters Program. She received one of only 18 study/research Fulbrights offered in France. While studying abroad in France as a junior, Sabrina Jimenez interned with a psychiatrist and began working with children diagnosed with autism. That experience changed her life. “My time there cemented that I am passionate about helping those children,” she said. The study abroad experience also influenced Litza Jimenez’s interest in applying for a Fulbright grant. Litza Jimenez is a finalist for an English Teaching Assistantship in Colombia, where she will be teaching in the same city her father was born. “Language proficiency, compelling connection to their study abroad experience, and teaching or research experience helped these four applicants succeed through a rigorous screening process,” said Jennifer White, associate director of International Studies. White advises Fulbright applicants and collaboratively works with faculty from varied programs to review the applications and advise the students. Isaiah Zukowski will also be in Colombia as a finalist for an English Teaching Assistantship. As part of his application, Zukowski highlighted his experience as a Spanish tutor for the Goucher Prison Education Partnership. The Fulbright program is also open to previous graduates. Conor Snow is a finalist for an English Teaching Assistantship in Germany and after working as a special properties associate within the Historic Properties Program of Baltimore City, decided to apply.